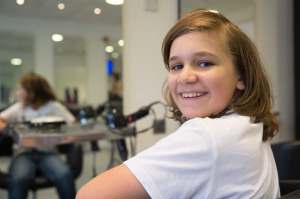 As announced a couple of weeks ago, my young son Ben had decided to raise some dosh for Cancer Research UK by having all his lovely locks shorn off. Given he’d be walking around completely hairless for a bit, it seemed sensible to do it at the start of the half-term break so he had a chance to get a little bit of head-fuzz back. Thus, last Saturday we headed to Charlies Hair Salon in Wakefield (note: no apostrophe) to get the deed done. …and it was done in less than ten minutes, all ready for the cold snap we’re due next week! In total, the boy raised £862.50 for Cancer Research UK, and we’re very very proud of him of course – well done kid, this is one very proud Dad! Thank you to everyone who contributed and who gave a few quid (and lots more sometimes!) when I asked, and thanks to Charlies who did the head-shave for free and ran a collection in the salon during the shave – you are really stellar people!